Alfred L. "Al" DeRenne was born in Chicago, Illinois, on November 1, 1913. He played baseball at the University of Illinois, and was signed by the Pittsburgh Pirates organization in 1935. The 21-year-old outfielder played 39 games with the Superior Blues of the Class D Northern League, batting .233. In 1936, he joined the Class D Penn State League's Jeanette Little Pirates, playing 112 games and batting .320. His manager that season was Wilbur Cooper, a former big league pitcher who'd won over 200 games in 15 seasons. Five years later, DeRenne would marry Cooper's daughter, Janice. DeRenne was with the Hutchinson Larks of the Class C Western Association in 1937, and played 143 games for a .302 average. Back with the Larks in 1938, he hit .305 in 107 games and finished the season with the Savannah Indians of the Class B South Atlantic League, where he hit .261 in 30 games. 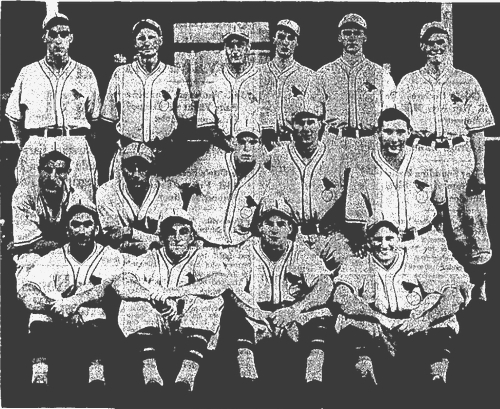 In 1939, DeRenne continued to play Class B baseball, this time with the Gadsden Pilots of the Southeastern League, and batted .304 over 146 games. DeRenne was proving to be an outstanding prospect but perhaps his only weakness was a lack of power at the plate. In five seasons, he hit only 12 home runs over 587 games. DeRenne returned to Gadsden in 1940, but his average plummeted to .209 over 51 games and he finished out the year with the Pine Bluff Judges of the Class C Cotton States League, where he batted .271 over 62 games. Al DeRenne's baseball career was put on hold in April 1941, when he was drafted for military service. He expected to miss the entire 1941 season and return to the game in 1942, but Pearl Harbor changed everything. He graduated from Officer Candidate School, Fort Benning, Georgia, and was stationed at Camp Pickett, Virginia, before being shipped overseas. Marrying Janice Cooper on April 25, 1943, in Washington, DC, First Lieutenant DeRenne promptly left for the Mediterranean Theater. Overseas for eight months, DeRenne suffered gunshot wounds to both legs while in combat against German forces in Italy on December 31, 1943. He was returned to the United States for treatment at Walter Reed hospital in Washington, DC, but doctors were unable to save one of his legs. Fitted with an artificial leg, Al and Janice settled in Van Nuys, California, where he worked for the Post Office, was a part-time scout for San Diego, played golf and coached in the Oak Valley Little League. His son, Coop DeRenne, was born in California in 1946, and played two years in the Montreal Expos system. Coop went on to become a professor in the department of kinesiology and leisure science at the University of Hawaii. His grandson, Keoni DeRenne, Coop's son, was drafted by the Atlanta Braves in 2000, and played 11 seasons in the minors. Al DeRenne, ballplayer, wounded veteran and recipient of the Purple Heart, passed away on September 20, 1981, in Van Nuys, aged 67.